When you think of fragrance in the garden, what are the first things you think of: roses, peonies, maybe magnolias? I think of spring and summer plants for sure. But February brings some wonders too. I’ve recently mentioned Daphne odora, which is now fully open and perfuming the Pond Garden. 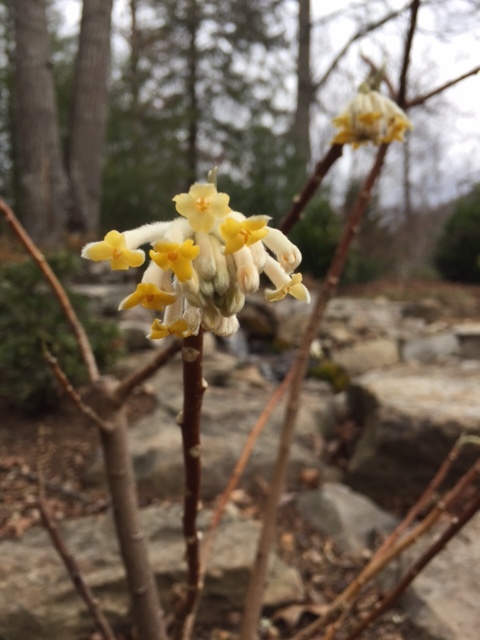 There is also a small-but-growing Edgeworthia chrysantha which has the most interesting flowers. The buds form in the fall and (if the stars align) open in February. The bud is a tight bundle of pale tubular flowers that dangle like earrings from the plant. One by one these flowers open, expressing a most wonderful soapy smell, like the best French milled bar. The Spirea thunbergii ‘Mt. Fuji’ is wide open and I thought I got a soft, sweet whiff as I passed by. I’ve since put my face in the plant, not really detecting anything. Was it the newly opened bloom that smelled or perhaps the warmth of the day that brought up the fragrance? Nothing else around the plant that I could see was in bloom. Hmmm. Yesterday I asked my good friend, Sieglinde, what smelled good in her garden. She took a walk through and reported back. In addition to her Daphne and Edgeworthia, she’s enjoying a common grocery store white hyacinth that was a birthday gift last year that she had popped in the ground. 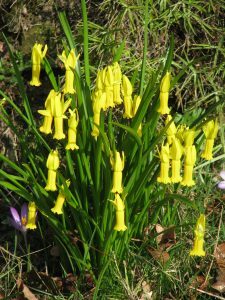 More typical of Sieglinde’s spectacular collector’s garden, she mentioned Narcissus cyclamineus and Cyclamen coum that she finds have a lovely light fragrance and surprisingly, her Galanthus nivalis which she noticed when she brought them in for the vase. 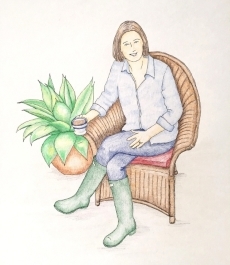 She said, “There is sort of a general fragrance in the garden, fresh but not distinct, earthy. If it rained there might be more fragrance even from grasses coming up.” Nice. 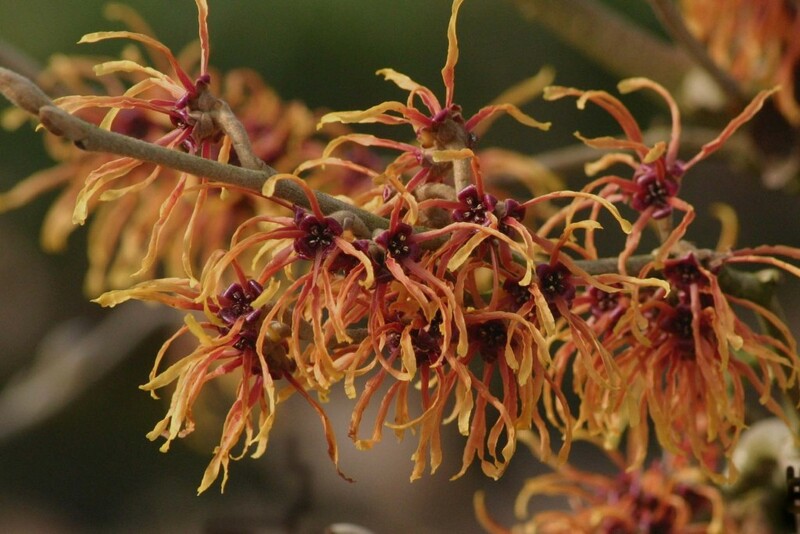 Many Witch Hazels, Hamamelis, bloom in February and some can be quite fragrant. The most desirable, in my opinion, are types that don’t hold their leaves from the previous year which obscures the floral display. 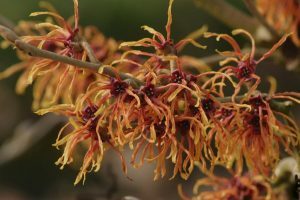 I found a great article on Hamamelis published by The Scott Arboretum that ranks various Hamamelis on leaf retention and fragrance, Ranking the Sights and Scents of Hamemelis. One of their favorites is H. x intermedia ‘Jelena’ which I’ve been meaning to add to Acorn Hill. 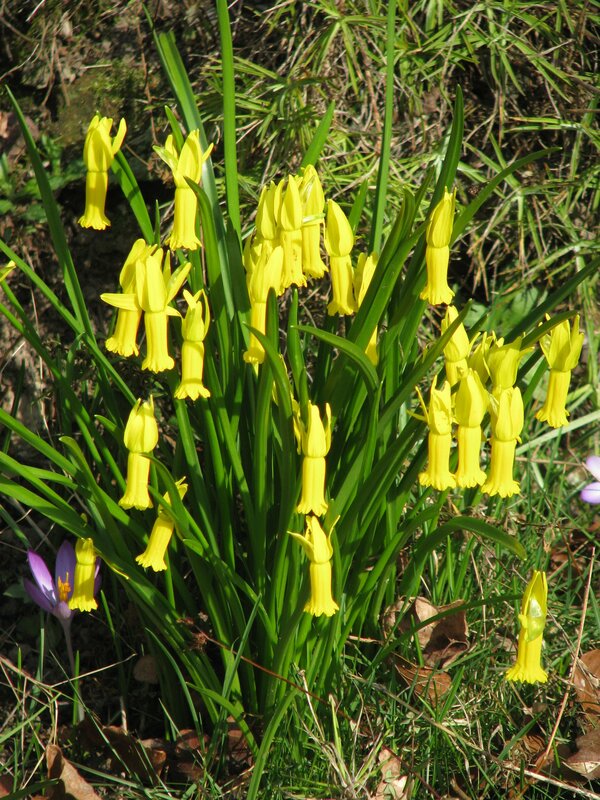 Perhaps next February I can include H. ‘Jelena’ in my February Fragrance list.